Legionella spp. bacteria are found in natural water bodies (e.g. rivers, lakes, and springs) and man-made water reservoirs. Legionella grow best in warm places, such as hot tubs, cooling towers, hot water tanks, decorative fountains, and large plumbing systems. Species of the bacteria may cause Legionnaires’ Disease or Pontiac Fever, collectively known as Legionellosis. 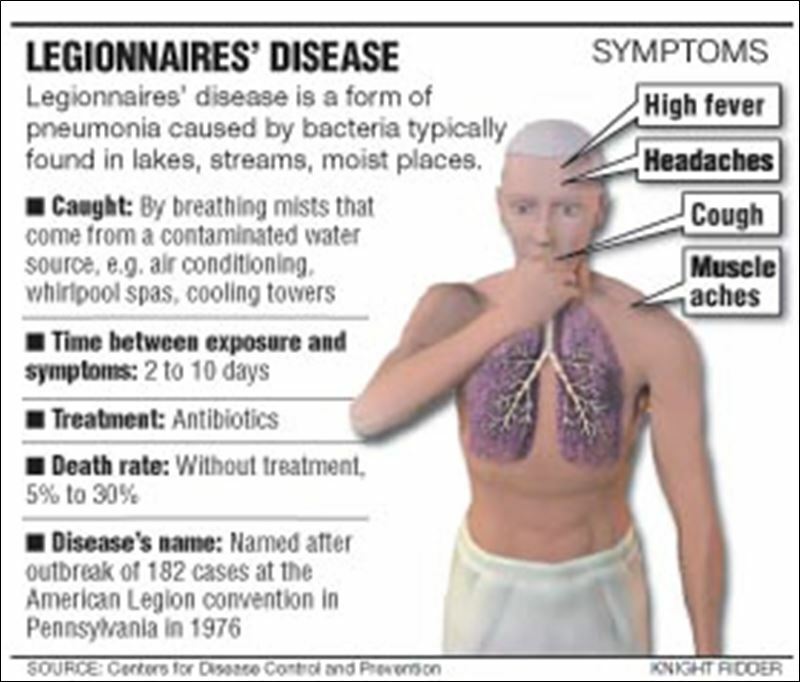 Legionellosis was first discovered in 1976 when 34 people attending the American Legion bicentennial conference in Philadelphia, USA died of a severe respiratory flu-like disease. The bacterium responsible for the outbreak, Legionella pneumophila, was identified. The source of the disease was believed to be a contaminated water source that contained the bacteria. Many similar outbreaks have been reported in various locations since then. Approximately 8,000 to 18,000 individuals are hospitalized with Legionnaires’ disease each year in the U.S.
Legionella bacteria are not spread from person to person. Individuals contract legionellosis by breathing in mist or vapor that contains the bacteria. Not all species of Legionella are harmful to people, especially a person in general good health. High risk groups that may become ill include heavy smokers, immuno-compromised individuals, the elderly, and others with underlying diseases. Legionellosis may cause flu-like symptoms with fever, dry cough and headache, or severe pneumonia and diarrhea. In order to prevent major outbreaks, the public should be aware of the disease, causative agent, and mode of transmission. More importantly, proper maintenance of water systems in which Legionella grow, including drinking water systems, hot tubs, plumbing lines, etc., is essential. Decontamination at the water source is the best way to avoid outbreaks. Scheduled monitoring of potable water for Legionella may be required in places where there are susceptible individuals. BCS provides analytical services for the analysis of water for Legionella species and detection of Legionella pneumophila. At least one liter of water should be collected in a sterile container. If the water supply is chlorinated (or other halogen), sufficient sodium thiosulfate should be added to the water to neutralize the residual. All samples should be transported at <10 degrees C in an insulated cooler. Recomended sample hold time is <96 hours. BCS Laboratories utilizes the Center for Disease Control and Prevention (CDC) Protocol for the analysis of water sample. BCS is accredited by the CDC’s Environmental Legionella Isolation Techniques Evaluation (ELITE) Program. Standard Methods 9260J is used for analyzing water samples with high bacterial count. ISO 11731 protocol is used for samples with low bacterial counts. Potential Sources and Sampling Sites for Legionella spp.